Sharon Lee Dwyer, passed away December 9, 2016 at Overland Park Regional. A Celebration of Life will be 3:00 pm Tuesday, December 20, 2016 at Bruce Funeral Home, Gardner, 913-856-7111. Memorial Contributions may be given to the American Lung Assoc. Sharon was born July 5, 1952, in Olathe to Thelma Viola (LaGalle) and Bernard Francis Dwyer. 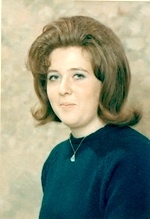 She was a 1970 graduate of Gardner Edgerton High School. She was an LPN with her CNA and CMA certification, and the Assistant Director of Nursing at Bedford Manor in Spring Hill. She loved to color, enjoyed doing puzzles and was a collector of M & M items. Sharon will be dearly missed. She was preceded in death by her parents. Sharon is survived by her son Michael Rousselo of Olathe; daughter Jennifer Rousselo and fiance’ Jesse Vail of Humboldt, KS; grandchildren Heather, Dylan, David and Justina; one great grandchild and another on the way; brother Terry Dwyer of Edgerton.